Green senior Bryce Ponn signed his letter of intent to attend and play collegiate baseball at Shawnee State University Friday afternoon. 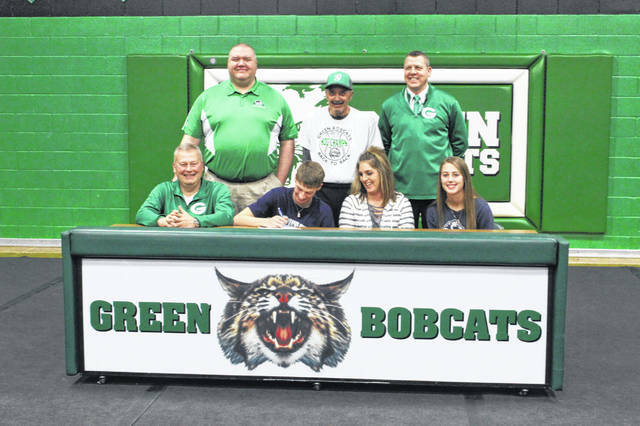 Green senior Tanner Kimbler signed his letter of intent to play baseball at Shawnee State University in a joint signing ceremony with teammate Bryce Ponn. FRANKLIN FURNACE – There was a special feeling amongst those gathered together in the gymnasium at Green High School Friday afternoon. Pride, excitement, jubilation; whatever emotional adjective you’d like to use, those gathered for the signings of Bobcat seniors Tanner Kimbler and Bryce Ponn to play baseball at Shawnee State University felt it when celebrating the pair’s outstanding achievement, and their ability to continue playing the sport they love for the next four years. Kimbler has starred on the baseball diamond and on the hardwood for four seasons in the Bobcat uniform, and upon graduation this May from Green and into the next chapter of his life, he’ll look back fondly on memories made, on and off the playing surface. When attending Shawnee State this fall, Kimbler plans on majoring in physical therapy. As a member of the Portsmouth Post 23 baseball club during the summers and playing for Green during the spring, Kimbler will always look fondly on the relationships he developed with Post 23 and East head coach Matt Miller, as well as Bobcats head coach Danny McDavid. Even though he has his college decision settled prior to the season, Kimbler still has plans for what he would like for himself and his team to be able to accomplish during his senior campaign. 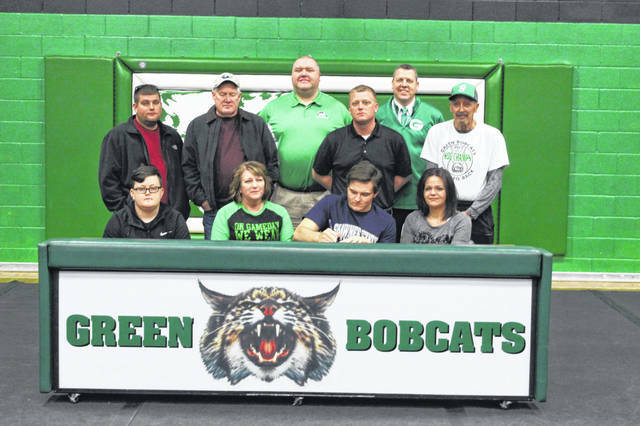 Friday’s joint signing between Ponn and Kimbler not only signifies their relationship as teammates and friends, but also the level of success the Bobcats have seen in all areas of athletics in the last couple of years. Shawnee’s proximity to home gives Ponn the ability to play the game he loves close to his home, but maybe more importantly, it keeps him close to his friends and family members he would have otherwise left behind, something that helped make his decision to become a Bear that much easier. Interestingly enough, Ponn also plans on studying physical therapy following graduation this May and upon enrolling at Shawnee State. After a knee injury sustained during football season, Ponn made the decision to study physical therapy after going through the rehab process and learning what the profession takes first hand. Ponn also highly regards McDavid, and says that throughout his high school career, he wouldn’t have had any other coach lead him along the way. Like his teammate, Ponn also believes that this year’s group of Bobcats have unfinished business to attend to during their final season donning the green and white.